Blog name generator plays an important role to choose a cool name for a newbie blog. Choosing a classic name for your newly started website is crucial. 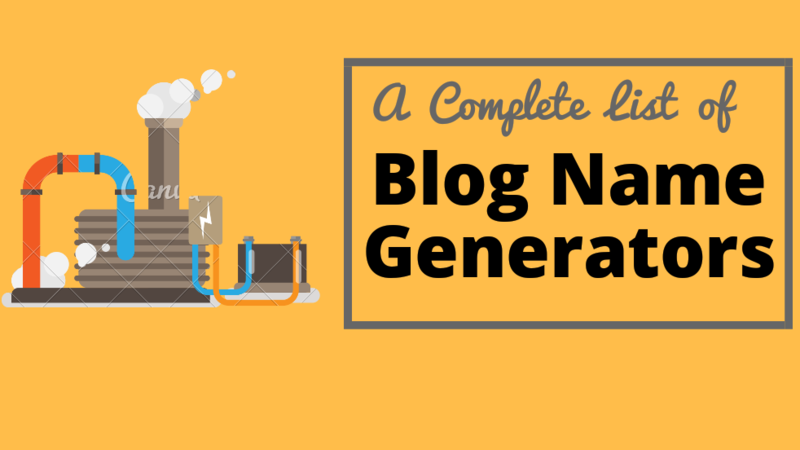 Blog name generators make this task so easy. Here is a complete list of website name generators to choose a wise name for your newly starting blog. There are thousands of websites where you can easily enter a keyword and you will get cool domain name ideas. However, some of these websites give you worst name suggestions. That’s why I compared the ratings and selected most preferred websites to generate a cool name for your website. There is no need to think a lot about name of your site. Just find a keyword and start searching. Let’s have a look at this list. SpinXo.com is the best site for finding a creative for your new website. You can create a cool name of any niche. You just need to enter a keyword and click on search. Now you will a get a list of all the suggestions. It’s super easy to use and understand. It also gives us an option to check wether a name is available on social media sites to create a social media account. After starting your blog, you will definitely need to create a social media account on most frequent social networking sites like Facebook, Twitter, Pinterest, Instagram etc. Bestusernamegenerator.com is an another classic website to search familiar domain or username for your website or blog. It has a list of catogery to choose a related name of your blog. For instance, you can directly choose anything like animals, arts, family, music, science, sports etc. By clicking on a specific catogary, you will see some really cool domain name examples on the page. These names are really unique and look super amazing. You should try here atleast once. I love this feature on this website. Wordoid.com is an impressive site to select a name for your blog. It has similar features like others but additionally, it gives you a platform to find blog name in other languages too. For example, you can find blog names in English, Spanish, French etc. They also give you an option to choose quality of words. You can choose High, Medium or Low quality to find a best name for blog. It’s quality levels elaborate how wordoids look, sounds and feel. Higher level means it will show natural words for the selected languages. It gives you an other feature as well. You can also the pattern and the length of your domain name. Blog name generators typically dont provide these features. Its a great add-on on this site. Panabee.com is another tool in this list. It is also a famous name to generate cool blog title ideas. I personally love its website design. We can just land on homepage and there is a big search bar on top. You just need to enter a related keyword and you will get many cool options for your website name. It also provide you an option below to check that username is available on social media sites or not. It is an crucial task to check Becuase after buying domain, you won’t like to change username on fb, twitter or pinterest. 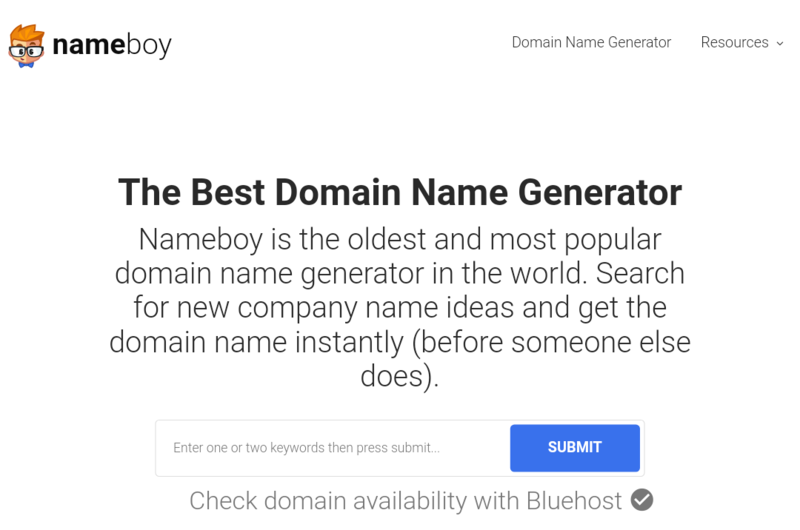 Nameboy.com is a trusted website to find cool names for your newly created websites. It gives a wide range of titles to select for your site or blog. You can easily visit its homepage, enter your related keyword and you will get many different options to choose from. There is definitely a loop hole here what I hate most. When you will click on search button, it will take you to another page on bluehost by using its affiliate link. All the other things are ok here. However, I was not really happy with results on this site. The blog name generators basically provide some name which are super cool and look dashing. Here are some suggestions but are not really superb. Nonetheless, you might still give it a try and see what you like or dislike there. Shopify is a famous ecommorce website in the world. There are many different products they provide to buy and sell different products. It directly suggests you which domain names are available to buy. You can directly buy a domain name from here. You can also choose which server you want for your website. For instance, you can choose .com, .org, .edu etc for your upcoming website. Namobot.com is absolutely a favourable website to find out a classic name for a new blog. It directly finds that domain name is available to register or not. If your suggested domain is not possible. This will ask you to choose a related name from a wide range of blog name ideas. It is easy to use and user-friendly website. It has different catogeries to choose a name. You can choose a name from funny, common or mixed blog names. I want to apologize to put domainwheel.com at number 8. It really deserves a much better rank. It has many different features to choose a real name of your success. Here I will try to explain some of it’s features. But if you wanna see all the functions. You should visit the site first. Firstly, when you enter a keyword in the search bar here. You will get some ideas of domain names available right now. After that you will see an option Sounds Like below. Here you will see se suggestions which have same sound like the keyword you entered. After that, you will see an option called Rhymes With. Here you can see some words related to your keyword which makes a rhyme. It may be like (WheelDeal). Name-generator.co.uk is a different type of blog name generator. You need to understand that your blog name should be related to your niche. For this reason, name-generator is the best tool in the industry. In addition, it asks you to enter so many details and it will give you many cool examples related to info you have given them. You need to enter your keyword, topic, synonyms of your keyword, related keywords and your full name. Then it will show you the best results. However it shows mostly long names. You can try it to see you like it or not. Namegenerator.biz. It is an another blog name generator in the market. It picks cool names by using some suffix or prefix. However, it does not generate really cool blog names but it gives you some suggestions using your suffix or prefix. Here you will get different catogaries to find a name. You can also find a Youtube, Facebook or Email name for you. You can also find username for games, baby and places. Basically it asks you yo enter a suffix and prefix. Then it will show you suggestions by putting some random words between these two words. I personally dont like this tool but you can check and decide by yourself. 1. How to write an incredible article to rank on first page. 2. Top 10 adorable sites to get free images for websites. 4. Top highest paying ptc sites without investment. 5. How to Install WordPress on Localhost Wamp. I hope guys these blog name generator will find a best blog name for you. These tools are great to find a meaningful SEO friendly names. 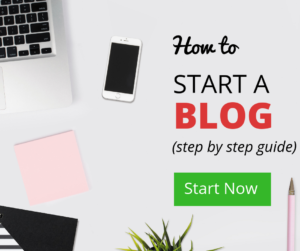 This way you can make your job easy and can focus on your blog foundation. Here is the end of the list. I hope guys you got some actionable blog name generators. If you guys feel that this post is helpful for you in any manner. Feel free to subscribe our newsletter and share with your friends on fb and twitter.